Maryellen Vickery, Owner of The Ballet School of Vermont and Artistic Director of Northern Vermont Ballet, unites over one hundred dancers from Northern Vermont ages 5 to 18 years old with theatrical lighting, staging and costumes to create this spectacular full-length ballet production for local performing art lovers. 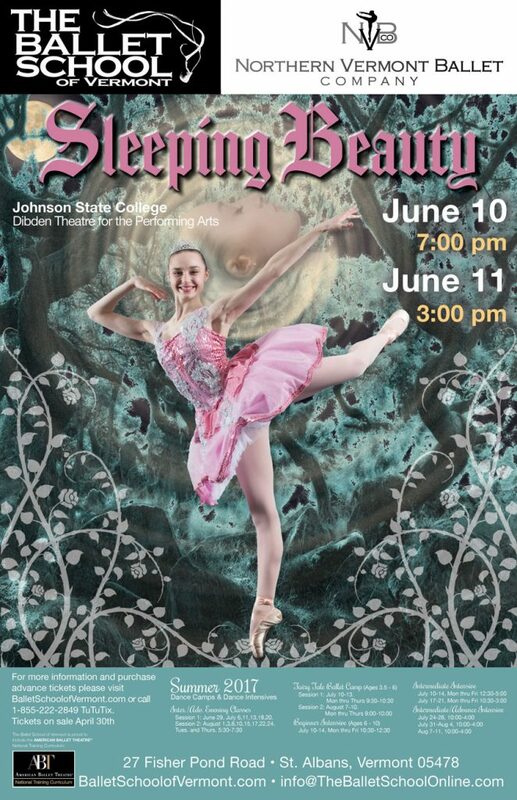 Our student company, Northern Vermont Ballet, repertoire includes solo and group variations from numerous classical ballets such as Nutcracker and Sleeping Beauty as well as original pieces of contemporary choreography. Contact us to invite NVB to perform at your community arts event! Credit or Debit Card orders open through June 18, 2017. Mailed 6-8 Weeks After Performance. To Pay Online, Email NVB@TheBalletSchoolOnline.com which performances and the quantiles of each and we will email you a PayPal invoice to pay with a debit or credit card or your PayPal account. Alternatively, you can send a Payment to NVB via your PayPal account. Our payment email is to NVB@TheBalletSchoolOnline.com. Please include your order details with any direct PayPal payments. We had another incredible ballet theater production thanks to support from our individual/business partners and The Ballet School of Vermont students and families. The Northern Vermont Ballet Company Board and dancers thank you!